Often one of the commonest shorebirds, larger than the Stints, but slightly smaller than Curlew Sandpiper. Longer bill than Stints is slightly down-curved. In summer plumage easily told by black belly-patch. 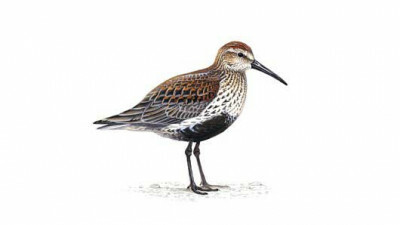 In winter, this patch is lost as are rufous tones to upperparts, then has grey upperparts with narrow pale fringes to coverts and scapulars, grey breast and white belly; told from similar Curlew Sandpiper by different rump pattern (white with dark centre), lack of white supercilium, darker upperparts and breast, and shorter bill and legs.